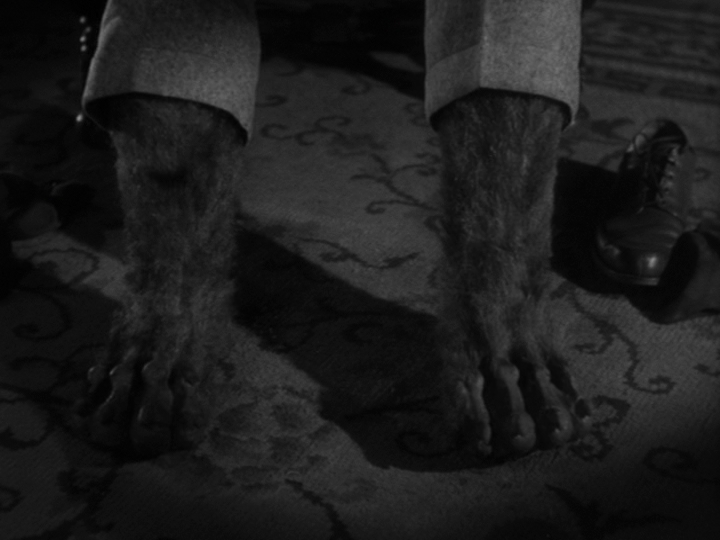 Werewolf of London, a 1935 release from Universal Pictures, is the film that forever changed how werewolves are viewed, introducing the concept that being bit by a werewolf can turn you into a werewolf, and that the werewolf transformation is triggered by the moon. 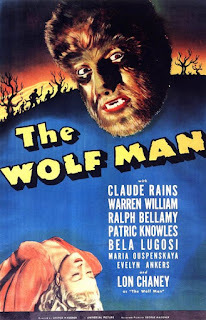 Six years later, those ideas that director Stuart Walker and writers Robert Harris and John Colton presented in Werewolf of London were brought to the screen again by director George Waggner and screenwriter Curt Siodmak in another Universal film, The Wolf Man. 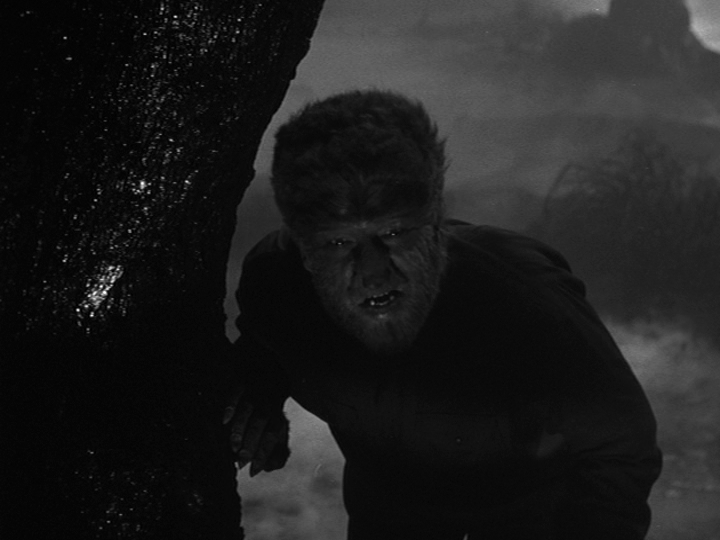 While Werewolf of London has sort of faded into obscurity over the decades (although Universal keeps it alive by including it in The Wolf Man sets), The Wolf Man became one of the most popular horror movies ever made and gave the genre one of its greatest icons. The alter ego of that titular icon is Larry Talbot, played by Lon Chaney Jr. After eighteen years spent living in the United States, Larry returns to his childhood home, Talbot Castle in Wales, after his older brother is killed in a hunting accident. Larry was always the neglected son in comparison to his brother, who had been the heir to the family estate, but he holds no ill will toward his father Sir John (Claude Rains). They start to reconnect and Larry settles into the castle that will now one day be his. Larry also starts trying to woo a local girl, Evelyn Ankers as Gwen Conliffe, who works the register at her father's antique shop. Although Gwen is engaged to someone else, she does end up accompanying Larry to the nearby gypsy camp - and they're joined by Gwen's friend, Jenny (Fay Helm). Unfortunately for Jenny, Larry and Gwen get preoccupied with each other while she's getting her palm read by a gypsy man named Bela, after the other horror icon who plays him, Bela Lugosi. 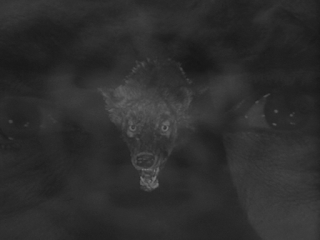 A frightening fortune (or lack thereof) from the gypsy sends Jenny off into the nearby forest, where she's attacked by a wolf. Larry shows up the fight the wolf away from her body and beat it to death with the silver-headed cane he bought from the antique store, but it's too late for Jenny... and Larry gets bitten. The people in this part of Wales are very aware of the werewolf legend and will take any opportunity to recite a poem about it: "Even a man who is pure in heart and says his prayers by night may become a wolf when the wolfbane blooms and the autumn moon is bright." The silver head on that cane was in the shape of a wolf's head and a pentagram, the sign of the werewolf. 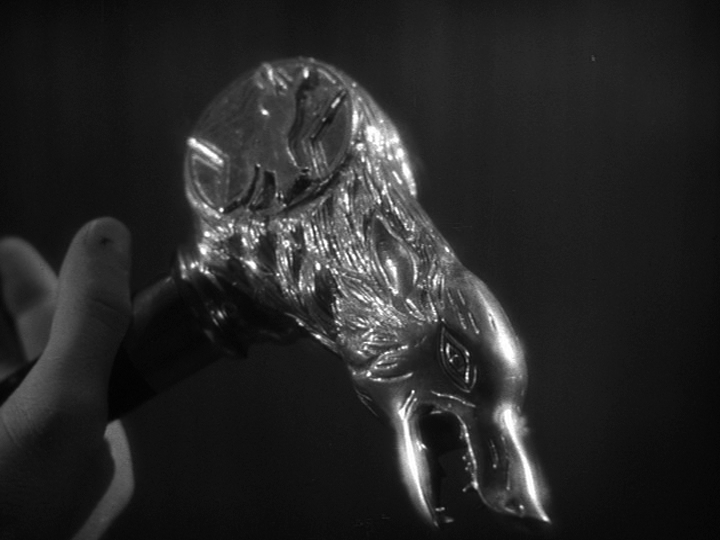 Bela envisioned a pentagram on Jenny's palm because he was the werewolf who was going to attack her. Now Larry is afflicted with the curse. By the light of the moon, he transforms into a bloodthirsty beast that rampages through the countryside and can only be killed by silver - be it a silver bullet, a silver knife, or a silver bludgeon. Even though Bela looked like a regular wolf when we saw him attacking Jenny (it was actually Chaney's German Shepherd), the werewolf Larry sports that look everyone is familiar with - very hairy, his feet turned into paws, claws jutting from his hairy hands, the tip of his nose looking like a wolf's nose. This is the werewolf design makeup artist Jack Pierce had originally come up with for Werewolf of London, but it was rejected then because the decision was made not to obscure star Henry Hull's face so much. 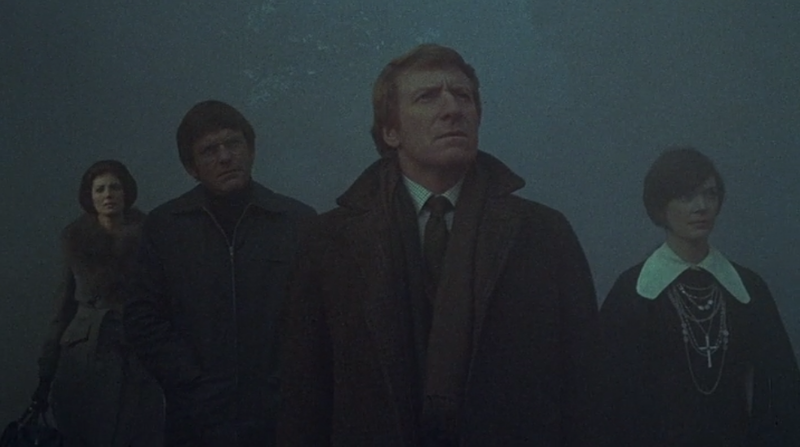 Chaney's face got that obscuring treatment, and he'll always be remembered for it. The fact that the better werewolf design conceived for Werewolf of London was actually used in The Wolf Man is an example of how the film uses concepts from that earlier movie and takes them to the next level. 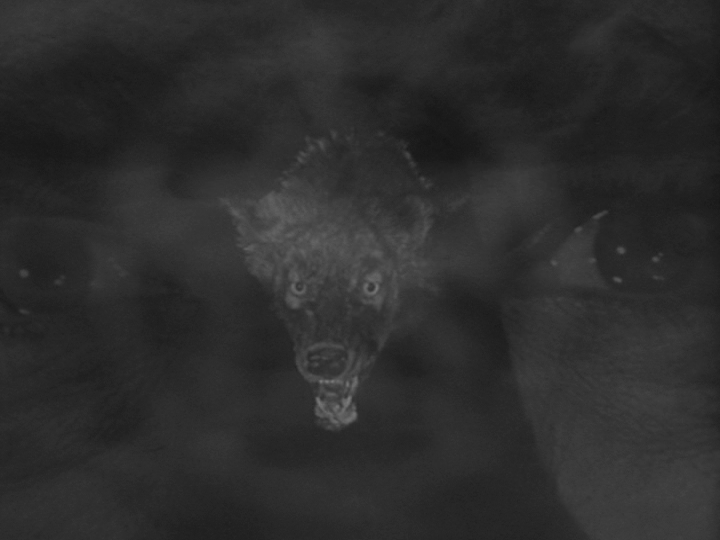 The story, the characters, emotional content, the presentation of the werewolf, they're all a step up from London. Werewolf of London is a good creature feature with great ideas, and those ideas were used as a foundation to make The Wolf Man into a true classic. More than seventy-five years after its release, The Wolf Man still holds up as an exceptionally well made, highly entertaining film. Bram Stoker's 1897 novel Dracula is a story that has been adapted for the screen time and again, so when director Francis Ford Coppola and screenwriter James V. Hart's 1992 adaptation of the novel plays out before you, you might have a strong feeling of déjà vu. How many times does a viewer really need to sit through the scenario of young, London-based solicitor Jonathan Harker (played here by Keanu Reeves) traveling to Transylvania to meet a Count Dracula (Gary Oldman in this version) about the London properties the Count wants to purchase? I have seen it several times myself. Of course, we all know that Count Dracula is a bloodsucking immortal, and Jonathan ends up trapped in his castle, attacked by his vampire brides while the Count catches a ship to London, bringing death with him. Even though we've seen these ideas before, Coppola and Hart have to be commended for staying rather faithful to the source material, even presenting sequences with narration from letters and journals written by characters, much like the epistolary novel. They don't stay entirely faithful, however. This film adds an angle to the story that Stoker did not write - the idea of a reincarnation romance. The movie begins with a flashback to the year 1462, when Vlad Dracula was a knight in the Order of the Dragon, battling the Turks for Romania. When his fiancée Elisabeta (Winona Ryder) receives a false report that he has been killed in battle, she jumps to her death in the river. 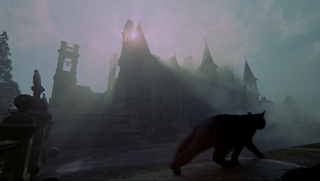 And when Dracula discovers that his love is dead, his rage has an incredible effect on his surroundings. He plunges his sword into the stone cross in the chapel where Elisabeta's body has been laid out and blood pours from the stone. Dracula drinks this blood, and that's how he becomes the immortal blood-drinker we know him as. The rest of the film is set in 1897, by which time Elisabeta has been reincarnated as Mina Murray... who happens to be Jonathan Harker's fiancée. Upon his arrival in London, Dracula seeks Mina out, and as he creates chaos around them, he gets them to realize their connection and fall in love with him. The love story aspect makes it almost possible to sympathize with Dracula at times, but then our sympathy is hindered by the fact that this Dracula also comes off as being intensely evil at times. When he has taken the form of a human-sized bat and can cause a crucifix to burst into flame just by looking at it, you realize this guy is a little more than just lovesick. The romance does help give this adaptation its own identity among the many other Dracula movies out there, as does the fact that it is visually stunning. The cinematography is wonderful, as are the dazzling special effects, which are especially impressive when you take into account that they are practical, in-camera effects. 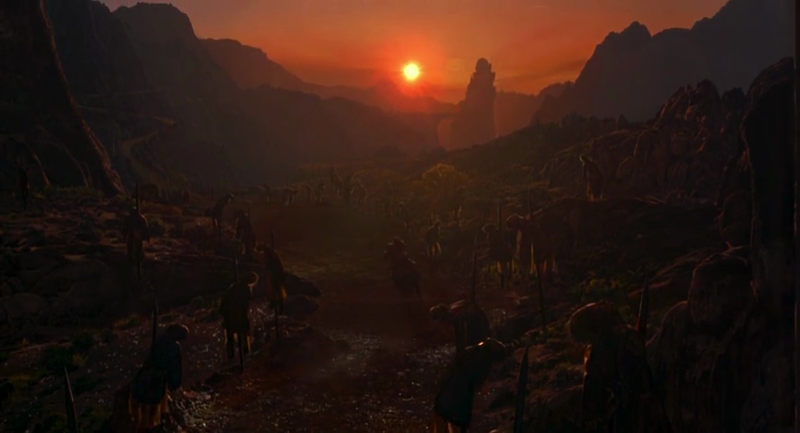 When others urged Coppola to put some CGI to use for this one, he instead hired his son Roman to do things the old fashioned way. That decision really worked out. Some of the acting in this film has been criticized, but I don't really take issue with it. 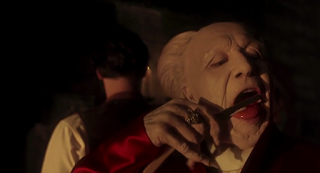 My favorite performance comes from Anthony Hopkins, who hams it up a bit as vampire killer Professor Abraham Van Helsing, who has a humorous lack of tact. 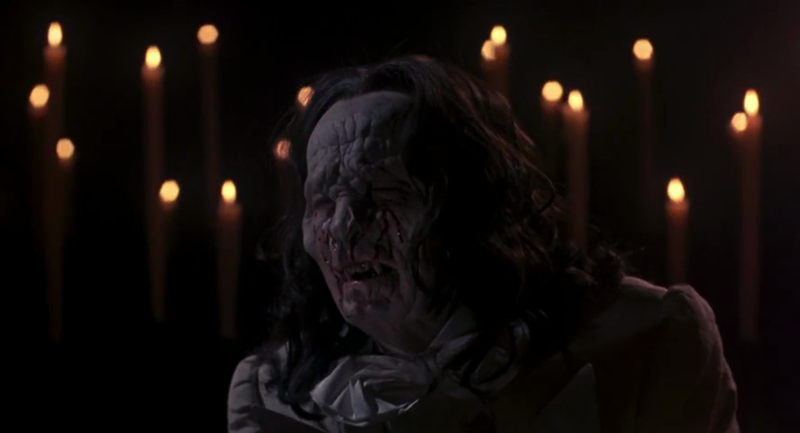 When a woman is killed by Dracula but Van Helsing knows she'll soon be rising as a vampire, he tells one of the mourners in a matter-of-fact way that he intends to cut off her head and take out her heart. When Mina later asks him if this woman was in great pain, he replies, "Yeah, she was in great pain, then we cut off her head and drove a stake through her heart and burned it, and then she found peace." It can get tiring to see the Dracula story told over and over, but this is a telling that's worth seeing. Based out of Massachusetts, The Dungeon of Dr. Dreck is a horror host show that has been haunting the airwaves since 2004, and even spawned a feature film spin-off in 2008. 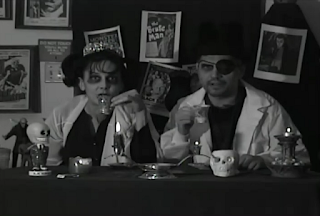 The show is hosted by eyepatch-wearing mad scientist Dr. Dreck and his zombie cheerleader sidekick Moaner. As of the start of this episode, Moaner has just recently returned from zombie cheerleader camp, so she's able to demonstrate for the doctor a few different ways to walk like a zombie. Then the movie gets started. A 1962 Italian production set in 1800s Germany, the movie has two exceptionally cool titles to choose from in the United States; it has released as both The Slaughter of the Vampires and Curse of the Blood Ghouls. The title is the best thing about the movie, as writer/director Roberto Mauri padded out his standard vampire story - a young woman falls under a vampire's spell, her husband and a vampire expert try to save her soul - with scenes that go on for way too long. A horse-drawn carriage rides through the countryside for several minutes. There are long stretches of not much. The party scene might still be going on now. The woman and the vampire have a fun dialogue exchange, if you can get past the dubbing. 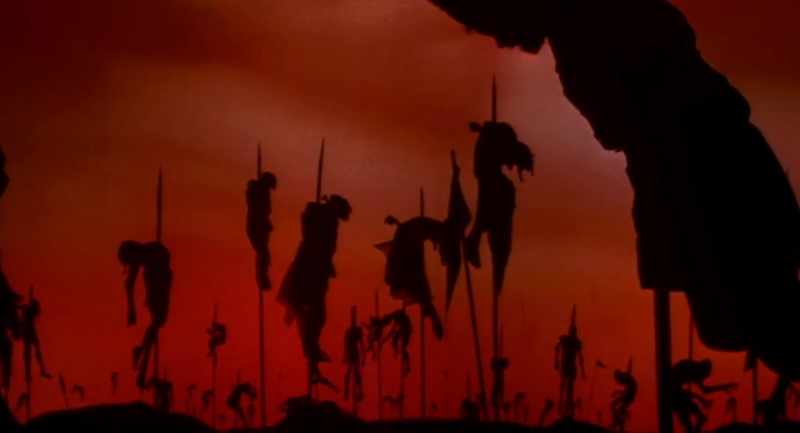 The pre-title sequence, in which the vampire loses his former love thanks to an angry mob, was also a highlight. The film does have an atmosphere that some viewers might like, but I had trouble keeping my attention focused on it. The Slaughter of the Vampires might have been easier to get through with more interjections from the hosts, but Dr. Dreck and Moaner only appear at the beginning, middle, and end of the epiosde. For the break in the middle, they hand the show over to a psychic called Madame Nicotina for a goofy segment where she's reunited with a long-lost sister, the funniest thing being how rude Nicotina is, and how disinterested she is in everything. At the end, they wrap up with some class and romance... actually, a disastrous attempt at class and romance. I like the characters of Dreck and Moaner, and this episode left me wanting to see more of them, as they weren't in it nearly enough. 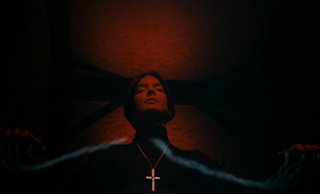 Before Escape to Witch Mountain and before Dirty Mary, Crazy Larry, director John Hough took the helm of The Legend of Hell House, a haunted house movie based on the 1971 novel Hell House by Richard Matheson. Matheson handled the screenplay adaptation himself, making some tweaks to his story along the way, like moving the setting from Maine to England (which was necessary since the movie was being filmed in England) and toning done the violence and sexual content. While this change sounds like the request of producers who don't want to cross the censors, internet trivia claims it was a creative decision on Matheson's part, intended to give the film "a more brooding atmosphere". There is a great, uncomfortable atmosphere to the movie as it builds itself up to have the potential of being one of the scariest horror movies you've ever seen. The set-up is perfectly simple: in an effort to prove that there is life after death, a team of investigators consisting of a physicist, his wife, and two mediums are hired to spend four days within the Belasco house, a.k.a. Hell House. A place described as the "Mount Everest of haunted houses". For their trouble, they'll be paid £100,000. When the group arrives at Hell House, the place is shrouded in a thick fog. A great way to get things started. We learn that the house belonged to a very evil man who committed pretty much every violent or sexual thing imaginable in its rooms, and would invite friends over to join in. A fine back story for a haunted location. The owner disappeared, but twenty-seven of his guests were found dead. So we have the scary place, we have the reason for characters being there, that's all we need, now it all depends on what happens within the walls of Hell House and how the scares are presented. Eight people have died during previous investigations of Hell House, one of the mediums was the only person to make it out of an investigation twenty years earlier, everyone else was injured, killed, or driven mad. The promise of £100,000 has drawn him back, but we know it's only a matter of time before there are more deaths and injuries, and he might not make it out alive again. Some crazy stuff occurs within Hell House and Hough brings it to the screen with a great eye for cool visuals, but things don't get quite as scary as the characters built it up to be, I never feel any dread about what might happen next. The ghostly activity reaches a level that I could believe would actually drive people insane. What does happen includes the standard shaking furniture and breaking glass, an attack by a possessed cat, a possessed woman trying to seduce a man, a seance with floating ectoplasm, the discovery of a rotten corpse, the voice of a ghost asking to be loved, and an attempt at ghost busting by a character who doesn't believe there really are ghosts. The Legend of Hell House is an entertaining, well shot, run of the mill haunted house movie, but you have to get past the fact that it majorly over-hypes itself. This isn't a movie I've ever been a great fan of, but it is one I will always associate with one particular event: the first time I ever saw the premium cable movie channel Showtime. I grew up watching HBO and Cinemax, but I was curious about the other movie channels that were out there. 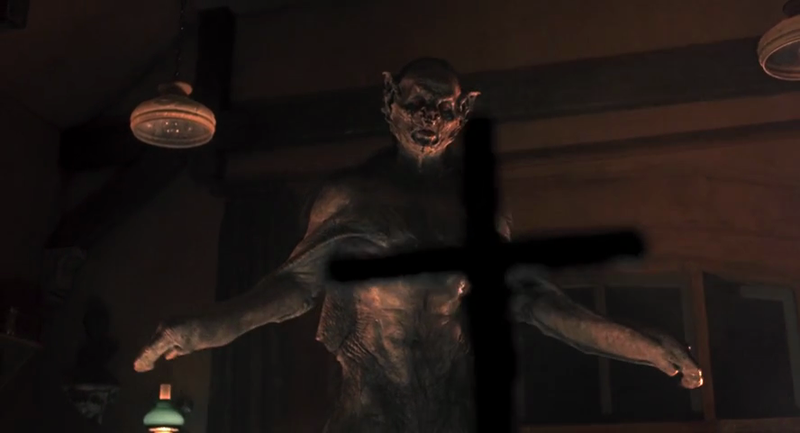 The day we got Showtime, I tuned in and there was The Legend of Hell House, showing in the middle of the afternoon.